Marcus Maddison in action for Posh at Charlton. Photo: Joe Dent/theposh.com. 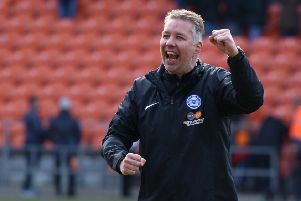 Peterborough United manager Steve Evans praised the attitude and impact of wantaway winger Marcus Maddison after tonight’s dramatic 1-0 League One win at Charlton (August 21). Substitute Maddison was sent on for his first piece of first-team action of the season with 30 minutes to go with the game in the balance at the Valley. Posh manager Steve Evans congratulates match-winner Jason Cummings at the end of the game at Charlton. Photo: Joe Dent/theposh.com. And it was Maddison’s superb cross that led to an 89th foul on fellow replacement Toney which enabled Jason Cummings to win the game from the penalty spot. It settled a fiercely-contested encounter during which both managers were cautioned. The win kept Posh top of the table on goal difference from Portsmouth who also won away from home tonight. “Marcus Maddison has needed time,” Evans stated. “He was told all summer he was going to the Championship and when it didn’t happen it bothered him and I’m not surprised. “His head hasn’t been in the right place for him to rejoin the group, but we had a chat recently and since he’s been back with the squad he has been excellent. I’m told he has never trained as hard as he has in the last few days and he was terrific on the pitch tonight. “He will get to the Championship one day. It’s where he belongs, but if he stays here he can also help us get there. “By sending him on it proved I wanted to win the game. I wasn’t prepared to settle for a draw at a strong side and we were rewarded for our bravery. “It was a great cross from Marcus which led to the penalty and Ivan Toney’s presence in the area was also a huge factor. “It’s a great result for us against a Premiership club in waiting. Charlton played with the desire their manager showed as a player. “It was a fiesty game at times and I didn’t think Siriki Dembele got enough protection which is what I was questioning when I was cautioned at half time. “We played well in the first-half and I was disappointed not to get in front, but we had our moments in the second half as well and when we had to defend we did it superbly. “Obviously I’d have snatched your hand off if you’d offered four wins in the first four games, but I’m also not surprised we’ve done it. “We have brought big characters to the club this summer and they have already shown their worth. They had a huge test tonight and we came through it superbly. “We want to be the hardest working side in the league on and off the pitch. We didn’t always play smart tonight, but we didn’t stop working or fighting.